Dénia is situated at the north of the province of Alicante, with special warm weather and a great many sunshine days with a mean average annual temperature of 20ºC. Dénia’s beaches are of remarkable beauty and it has a historic centre where the castle raises majestically right in the centre of town. Mount Montgó, declared a Natural Park, is only a few metres from the sea and fishing boats come and go whilst they mark the rhythm of everyday life and provide Dénia with the best of the food of the sea, making it the celebrated cuisine haven it has become. A climb to the castle, a visit to museums, churches, streets and old quarters, a walk in Montgó Natural Park, watch how ships arrive to the fish exchange, enjoy sand beaches or practice a sport, living fiestas with the locals and getting to know the surroundings, amongst many other activities. To the north of the district there is the area known as les Marines (or las Marinas), where you will mainly find long fine sandy beaches. To the south of the district there is the area known as les Rotes (or Las Rotas), which starts with a sandy beach and gives way to rocky coves, colourful and hidden, that display a crystalline landscape of unique beauty. 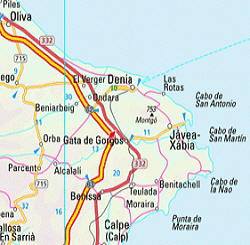 Dénia is surrounded by natural spaces of high ecological value. Between sea and mountain, sheltered by Mount Montgó and by the Mediterranean Sea and next to the Cape of Sant Antoni, Dénia breathes the sea air, smells of orange blossoms, Mediterranean flora, and nature. The Mount Montgó Natural Park was officially declared as such in 1987 thanks to its landscape values, flora and fauna. Mount Montgó extends forming the impressive Cape of Sant Antoni, which reaches the sea forming a 160 m. high cliff. At the feet of the cape there is the Cape of Sant Antoni Natural Reserve, with a high level of preservation, which gives it a high environmental scientific and ecological value. The wealth of the bottom of the sea with micro reserves of flora along the rocky coast and the existence of polytonal prairies all along the coast, considered of community interest, situate us in one the Iberian Peninsula’s best enclaves for scuba diving. The visit to Dénia’s markets and open air markets is a must. You will find all sorts of products, from fruits and vegetables to antiques or handicraft products. Go visit the municipal market and buy sea and land products. Visit the weekly open air market on Monday and don’t forget to go to the antiques flea market on Friday. Take advantage of your walk in the port to go through the stalls in Cervantes Esplanade, buy fish at the Fish Exchange or simply go past the shops in Dénia where you’ll find a great variety of products.